These courses are designed for anyone interested in learning to give an effective Thai Massage. Previous bodywork training or yoga training is recommended, but not required. The material is easy to learn and is focused on postures that are both safe and non stressful for the giver and receiver. Each day also includes some theory, insight and inspirational talks to prepare the student for a transformational day of practice. There is time for Q & A as well as personal feedback and hands on assistance from the instructors. These four days combine to prepare one in all the skills necessary to offer a complete and safe two hour Thai massage. With a strong emphasis on proper body dynamics and how to use leverage, you will learn how to effortlessly apply pressure to sore muscles, energy lines & trigger points as well as learn how to bring your partner through a series of assisted yoga stretches to fully open and relax them. This training has been refined for over a decade to offer all students the ability to master these skills in a short amount of time. After certification, all practitioners should be able to offer this treatment with ease and grace. Each day you will learn a new thirty minute routine focusing on a specific body area, ultimately resulting in a complete two+ hour sequence. You will receive a detailed guidebook with pictures and descriptions to aid in your ongoing practice. A complimentary DVD and online video support is also provided to practice at home with. Also called 'Thai Yoga Therapy,' these therapeutic courses are designed around learning the correct application of more advanced and creative Thai style stretches. You will learn how to release specific muscles by combining Thai Yoga stretches with Positional Release techniques. These stretches fit perfectly into the 'Foundational Flow' or they can be strung together to create a full one hour Therapeutic Thai treatment. This course will also integrate how to apply PNF techniques into the stretches to target and release specific muscles with ease. We will look at how to treat various conditions such as sciatic pain, tight hamstrings, and low back pain. We will also learn techniques to easily release the Psoas, the QL and how to bring the hips into balance. Although, these courses compliment other Yoga Therapy or Thai Massage trainings, no previous experience is required. After completion, all practitioners should be confidant to include these new skills into their healing regimen. This course requires more skill then the 'Foundational Flow' course. It is designed for those who are already comfortable stretching their clients. You will be working on the ground using your hands, knees, forearms, feet and elbows to apply compression and stretches. All students must be comfortable moving their own bodies on the ground into various positions. Please watch the sample video clips below to see if you could imagine yourself doing these maneuvers before registering. Previous study with me is recommended but not required to take this course. You will receive a detailed manual with pictures and descriptions to aid in your ongoing practice. A complimentary DVD and online video support is also provided for home study. 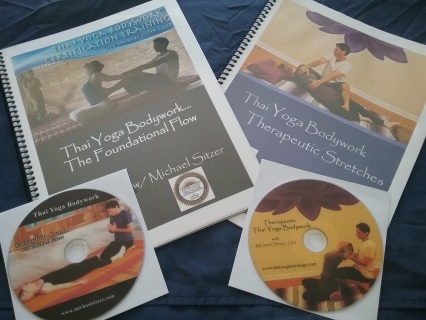 For certification, students will need to complete all six courses plus document ten practice sessions, including one on a professional Thai Yoga Bodywork practitioner. Please note that certification is not the same as licensure...More details on my 'Policies' page. Independent Verified Facebook Reviews Here!